Our methodical Events Sales Team is on hand to help you arrange your event from inception through to implementation. We can assist with all aspects of your event and have wonderful preferred suppliers that we work with on a regular basis. We have at least one Front of House Managers at every event who manage the staff throughout the function and they ensure that all aspects of our operations are met. Should you wish to have an Event Manager on hand to host your function including the management of your guests and running schedule, to ensure that your event runs seamlessly, this can be arranged at an additional cost. Our fully stocked bar is full of fresh, urban chic, unique cocktails & delights in our liquor cabinet, smoothies & coconut water with an eclectic variety of tapas on our Café Menu. Our talented catering partners stand ready to see to your every wish. Their expertise in preparing authentic local cuisine as well as established favorites often leaves diners asking for seconds. Spoil yourself... and your guests. Get our catering team to cook up a custom storm for your event! We can currently assist with Set Menus, Platters, Cocktail Dining (Canapés), Buffet, Spit Braai’s and Paella. We also have divine Dessert options including cakes. Our catering partners are more than happy to assist with any bespoke orders as well! We have wonderful Kosher and Halaal catering partners too who try and mimic our main catering partners menus. Should your guests not require full Kosher or Halaal options, we can assist with vegetarian or vegan options. 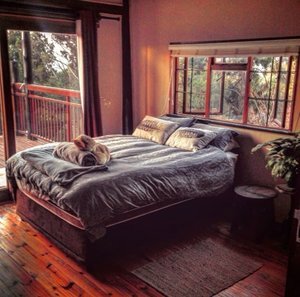 Nestled in the leafy, vibrant hillside of upper Kensington, our affiliated guest house offers one-of-a-kind, accommodation that feels like home. Take in an array of luxurious views, or explore our geodesic plant house where we nurture beautiful orchids and succulents. A perfect bridal retreat for all wedding guests as a lovely space to get ready, photograph and stay over.